Home > News > Public Relations > Back from the top of the World! Arrived back from my trek to Everest Base Camp. 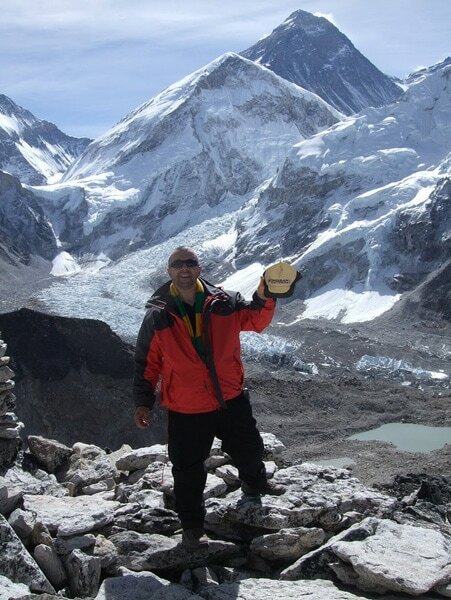 The above image shows me standing at the top of Mount Kala Patthar, at a height of 5545 metres. Mount Everest towers in the background, the weather was blustery, but extremely bright. The views of the Himalayan Mountain range was breathtakingly spectacular. The final climb was a tiring but rewarding and followed a week long trek overcoming periods of altitude sickness and continual headaches. It was amazing and something I will never ever forget. I will post more information and images shortly but in the meantime this is a quick post to say thanks to all the people made contributions to my charity collection.